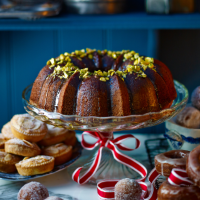 the traditional dried fruit-heavy, festive baking. Delicious with a spoonful of Greek yogurt and a steaming cup of fresh mint tea. 1. Preheat the oven to 170 ̊C, gas mark 3. Brush the inside of a 25-27cm bundt tin with a little melted butter, making sure it is thoroughly and evenly coated. Dust with plain flour and tip out the excess flour. 2. Blitz 100g shelled pistachios in the food processor until very finely chopped, add the ground almonds and whizz to just combine. In a separate bowl, cream together the butter and caster sugar until really pale and light (this will take about 3-4 minutes in a freestanding mixer). Add the egg yolks one at a time, scraping down the bowl with a spatula between each addition. 3. Add the orange and lemon zest, honey and rosewater and mix again. Sift the flour, baking powder, bicarbonate of soda, crushed cardamom seeds and a generous pinch of salt into the bowl. Add the nut mixture and buttermilk and beat in for another 30-40 seconds. 4. In another bowl, whisk the egg whites to stiff peaks. Add 1⁄4 of the egg whites to the cake batter and combine to loosen the mixture. Using a large metal spoon, fold in the remaining egg whites. Spoon the batter into the prepared tin, level with the back of a spoon and bake for 45-50 minutes, just below the middle shelf, until golden brown and well risen. 5. Leave to cool in the tin for 3-4 minutes, then carefully turn out and cool on a wire rack for 30 minutes. Transfer to a plate. 6 For the syrup, tip the ingredients into a small pan and bring to the boil. Simmer gently for about 5 minutes, until reduced by half and thickened. Slowly brush or spoon the syrup over the cooled cake. Scatter with the pistachios and serve warm or at room temperature.